– There must be one (1) Referee to carry out duties in the ring, but not to score, five (5) capable Judges and at least three (3) Juries. There must be one (1) Chairman of the Ring Officials to supervise the bout. All the above mentioned officials must be approved by the Executive Committee of the Federation. If there are not enough judges, it is possible to have three (3) instead of five (5) judges, but not valid for an international championship bout. The officials who perform duties of the referee or judges of the bout must not perform duties of the team managers, coaches, or ring assistants for the any athletes or teams participating in the competition or to perform duty in the bout where the athlete is of similar nationality as his/her own. The Executive Members of the Technical Committee of the Federation or their representatives have authorities to remove the referees or judges from the official lists (temporarily or permanently) when the jury considers that the referee’s performance is ineffective or the judge’s scoring system is unsatisfactory or unjustifiable. The referees and judges appointed by the Executive Committee of Federation must accept the invitation to perform their duties unless one refuses the invitation personally with reasonable excuse. If there is an organization responsible for the athlete’s expenses or the competition of same characteristics, that organization must also be responsible for traveling and accommodation expenses for the referees and judges appointed for the competition. 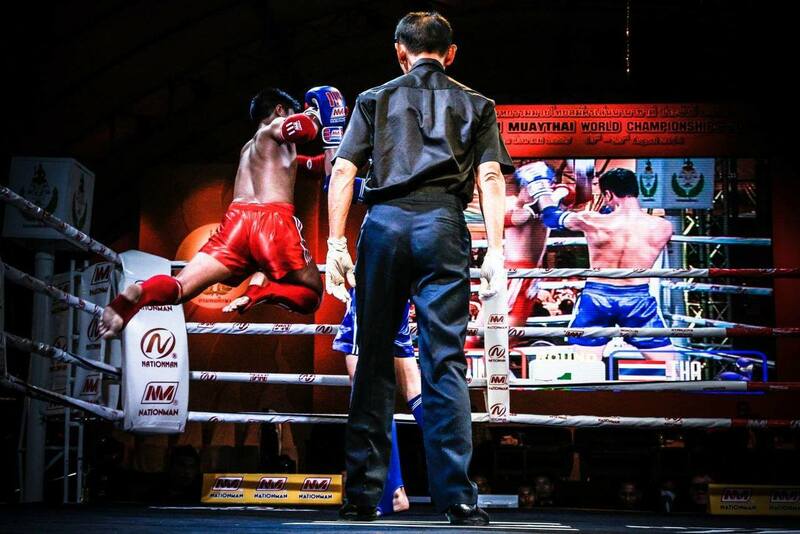 Amateur Muay Associations or Federations of their respective country for at least FOUR (4) years or have been appointed from such Amateur Muay Associations or Federations. a) He/she must have a health certificate from the doctor of that country certifying that he/she is physically fit and healthy enough to perform duties of the referee or judge. b) He/she must have the accreditation card or certification card or certification or logbook of referee and judge as evidence to show his/her experiences, physical fitness and the status of amateurism. c) He/she must have the ability to speak the international language well (preferably English). d) He/she must have been very successful in performing the referee’s duties or the judge’s duties throughout the period of appointment. – 1) Competition that involved women athlete’s bout, the Referee can be either a woman or a man. – 2) The team of judges may consist of women or men. – Being men or women of good characteristics, physically fit and healthy. He/she shall be not younger than 20 years old and not older than 55 years old of age and must go through medical check-up every year to ensure of possessing a healthy body and mind (nerves) to be able to perform duties. – At least attained a graduation of senior high school level or equivalent. – Must pass the training course and the examination for referee and judge of the federation. – Possess a valid I.D. cards and the accreditation card of the referee or the judge (certificate) issued by the federation. – The referees and judges of the federation have three (3) levels following A, B and C. The referees and judges are classified by the Committee of the federation as appointment. – The referees and judges for an international level must be classified in level ‘A’ and must be very skillful and of vast experiences in performing their duty consistently and continuously every year for at least six (6) years under the observation of the federation. – There should be a selection for outstanding referees and judges in each tournament to raise the morale of the referees and judges. – For international referees and judges, he/she shall be examined by the international Referees and Judges Committee appointed at least once every four (4) years. – International referees and judges who do not pass the examination or the physical examination or eyesight failure shall be removed from the international list, but they may be appointed as international officials for the functions of the federation. 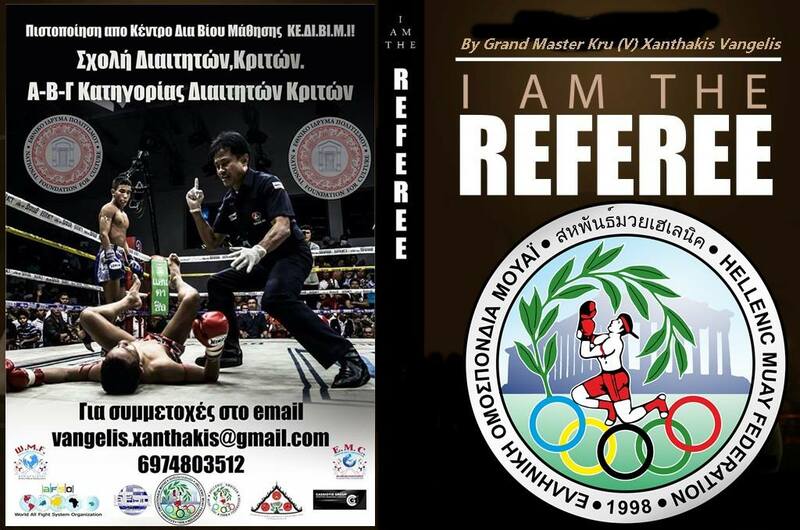 – As for the honorable international referees and judges: The executive committee of the federation will consider to honor them indefinitely for the retired referees and judges who show great achievements of performances by presenting (awarding) them with the title of “The Honorable Referees and Judges of Amateur Muay” as a recognition and prestige for their loyal and outstanding services. – The referees and judges who do not follow the judge’s rules and regulations or the ethics laid down by the federation shall be removed from the registration lists of the federation. a) Uphold the rules and justices. b) Closely control the bout at all times. c) Protect the weaker athlete from undue injuries. d) Inspect the athletes’ gloves and dresses. e) When the athletes is ready to start, the Referee calls both of them to shake hand in the middle of the ring and then tell them to go back to their respective corners to put on their head guards and mouthpiece (gum shields) before the competition start. – 1) ‘BOX’ /Chock– To order the athletes to go into action or compete with each another. – 2) ‘STOP’ –/ Yud To order the athletes to stop. – 3) ‘BREAK’ –/ Yak To order the athletes to separate from each another. g) Show a correct signal or action to tell the athlete’s fault for his/her rule violation. h) Collect the score cards from all judges when the bout is over. He/she examines the score cards and then hand them over to Chairman of the Ring Officials. made. When the winner is announced, the Referee then only is allowed to raise the hand of the winner. j) When the Referee disqualifies an athlete or stops the contest, he/she must first notify the Chairman of the Ring Officials and all the judges, then the athletes involved and the reason why he/she stops the competition. The Referee then must collect the score cards and hand them over to the Chairman of the Ring Officials. The Chairman of the Ring Officials than shall inform the Ring Announcer to make a correct announcement to the spectators thereafter. – Judges shall decide to score independently and accordingly to the abilities of the athletes without fear and prejudice. They must also identify the winner of the bout in accordance with the rules provided. – During the bout, no judge is to speak to any of the athlete or other judges or other people except the Referee. However, if necessary, they may inform the Referee during the resting interval about happenings, e.g. the Ring Assistant’s misconducts or loose ring ropes or etc. 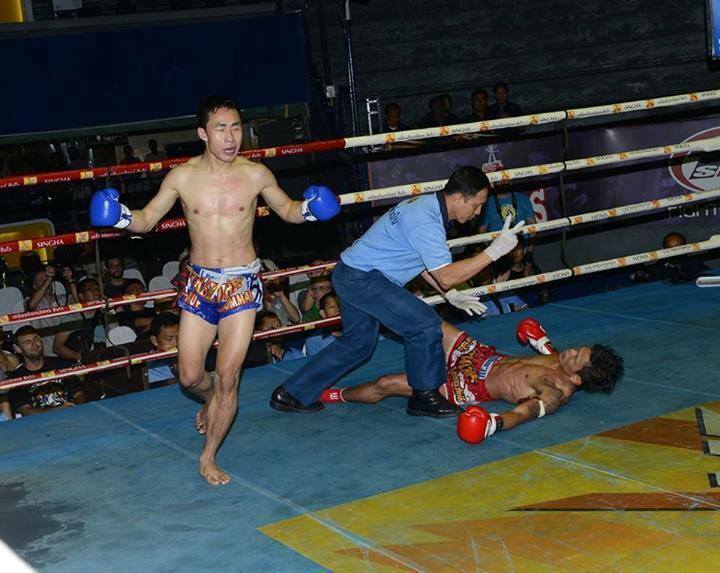 that is related to the competition only of which the Referee might have not notice during the bout action. – All judges must record the scores of both athletes in their respective scorecard as provided immediately after each round. When the bout ends, each individual judge must add up the score for each athlete, identify the winner and initial on the score cards. The decision of the judges must be posted on the scoreboard for the spectators to see. – Judges must not leave their seats until the referee declares the competition result. – Judges must wear navy blue or black trousers with belt, white shirt with navy blue or black bowties and proper shoes while on duty and if allowed, they may put on proper jacket over their shirt or the clothes provided by the Committee Officials of host nation. Amateur MuayThai Referee & Judge course based on HMF/W.M.F. Course Course Length: 3 days. – You will learn how to teach MuayThai lessons for beginners/intermediate. – You will be able to teach private classes and children classes. – You will learn the basic Pad Work/gym work to train your students. – You will learn to use the various combinations of training equipment such as the Thai Pads, Focused Mitts.